Our peach tree had mega flowers this spring and normally supplies us with far too many fruits by the end of July. This year, being loaded with blossoms, we assumed many fruits would follow. There is not one fruit on the tree. We're not sure of the age, it could be as old as 20 years (We live in Prescott Valley, AZ but only lived here for five years. ). 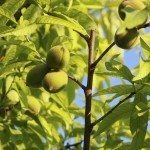 Is it possible that the tree is too old to produce fruit, or do peach trees produce for so many years and then take a break? Please help!! If your tree has lots of flowers but no fruit, I'd suspect that either the blossoms were killed by a late cold snap or there weren't enough pollinating insects around.